Will this PEQ get in the way? Will this PEQ box get in the way of this scope on this rail. The scope looks like its slightly elevated but I don't know if that would be enough. 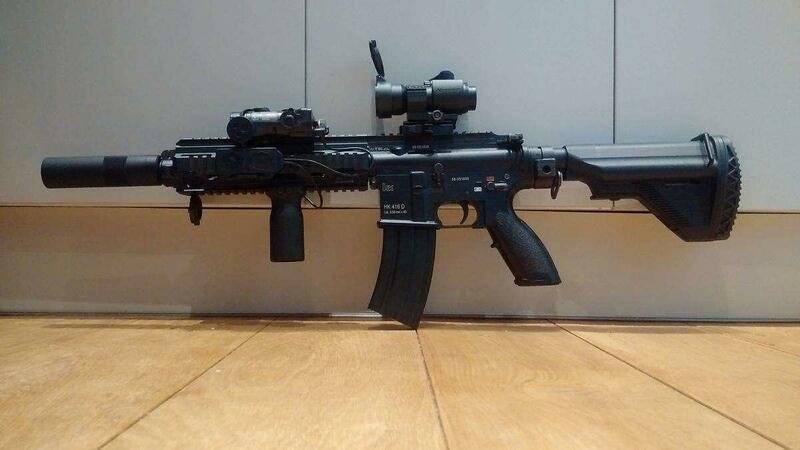 You could always mount the PEQ box on the (right-hand) side rail, it would then definately be clear of the scope. You can also buy an elevated mount/riser to lift the scope higher if you want the box on the top rail. It will be visable in your sight picture but if your using the red dot correctly (Both eyes open) it shouldnt matter. It won't obscure it enough that you'll be bothered. You will be bothered by the AWFUL quality of the FMA PEQ15 though, they're rubbish! Get a VFC PEQ15 or Element LA-5 instead. I run a PEQ box on my 416 and with a small QD rail riser it just lifts the holographic optic up enough so that it does not interfere with the optic.